The number of organizations that runs its servers locally is declining rapidly. This is shown by a market analysis conducted by market intelligence specialist Smart Profile, wherein nearly 5,500 decision-makers of Dutch organizations from the commercial and public sector were interviewed. As recently as eight years ago, nearly every organization (97.3%) had servers (mainframe, midrange and X86 servers) running on premises on their own location. The number of organizations with such on premise use has declined every year since 2010. In 2014, this figure stood at 74.1%. Today only 57.6% of organizations have servers locally. This represents a decline of 2.7% from 2017. Government institutions have registered the sharpest decline (11.1%) from a year earlier as regards on premise use. It is striking that relatively few government organizations (38.6%) and semi-public organizations (47.6%) have their servers running locally. By comparison, 74.6% of manufacturing companies have servers running on their premises. The move to the cloud comes clearly to the fore in the results also. The degree of penetration of 3rd party hosted (including private cloud) and cloud servers has risen from 10.3% in January 2017 to 19.1% in the same month this year, over all sectors and organizations. Most organizations in IT, telecom and utilities have their servers running in the cloud. When we zoom in on X86 servers, i.e. 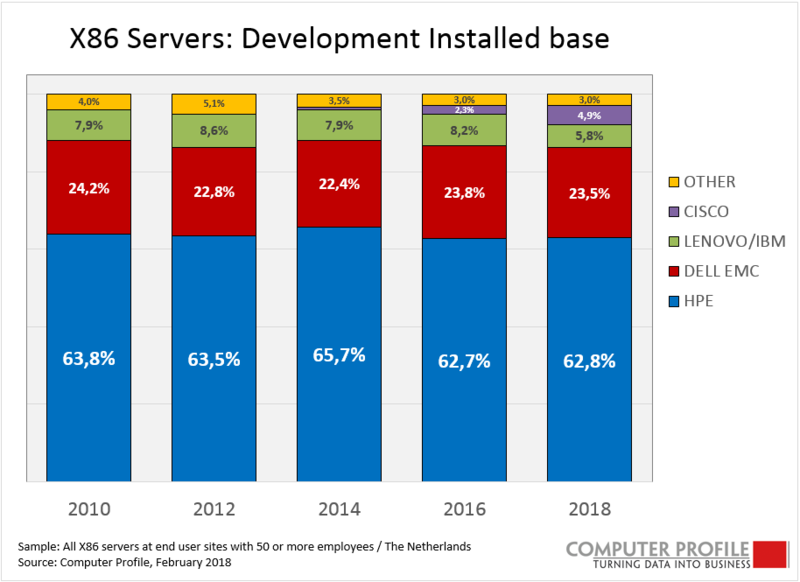 PC servers, we see that in spite of the move to the cloud (cf. 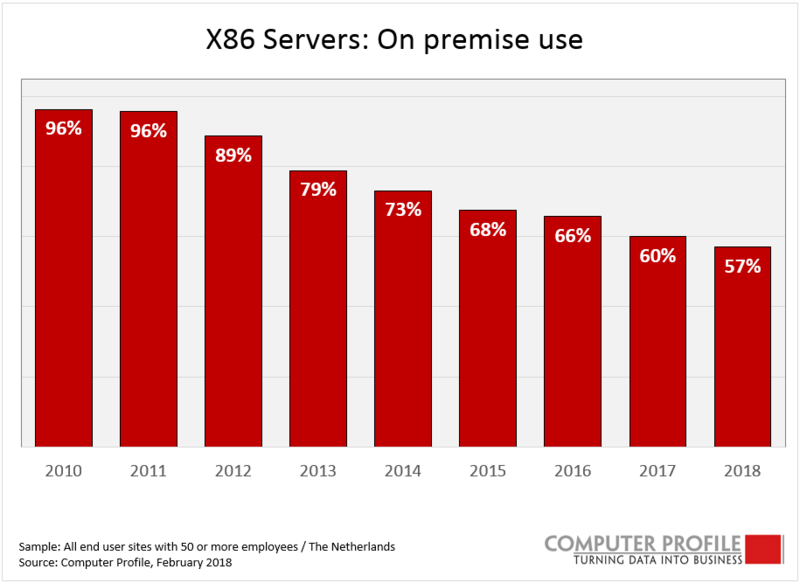 graph X86 Servers: On premise use) there are still a lot more servers running locally than in the cloud (57% versus 19%). The installed base shows minimal development. The same parties have dominated the scene for years, the top three being HPE (62.8%) followed at a distance by Dell EMC (23.5%) and Lenovo/IBM (5.8%). The latter’s degree of penetration is constantly decreasing, with a drop of 2.4% from 2016. Cisco seems to be benefiting most from this trend, with a 2.6% increase to 4.9%. As there are fewer and fewer locations with physical servers, the parties have a decreasing pie to share. Mainframe and midrange servers are still used in only 8.9% of the locations. This comprises local installations as well as remote and hosted use. IBM clearly sets the tone here, as 80% of the high-end servers consist of an IBM system.